COX’S BAZAR, Bangladesh (AP) — Three boats carrying ethnic Rohingya fleeing violence in Myanmar capsized in Bangladesh and 26 bodies of women and children have been recovered, officials said Thursday. Bangladesh border guard commander Lt. Col. S.M. 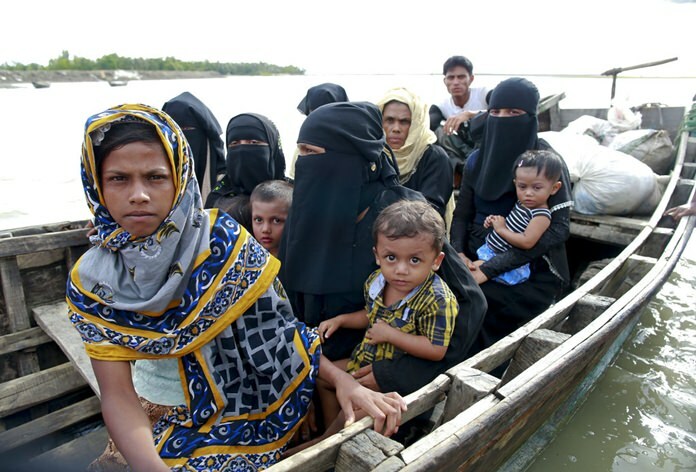 Ariful Islam said at least three boats carrying an unknown number of Rohingya Muslims sank in the Naf River at Teknaf in Cox’s Bazar on Wednesday. He said the bodies of 15 children and 11 women were recovered, and it was unclear whether anyone was still missing. The top government official in Cox’s Bazar, Mohammad Ali Hossain, said the bodies would be buried because no one had claimed them. Last week, Rohingya insurgents attacked at least two dozen police posts in Myanmar’s Rakhine state, triggering fighting with security forces that left more than 100 people dead and forced at least 18,000 Rohingya to flee into neighboring Bangladesh. Hundreds of people have been stranded in a no man’s land at the countries’ border, the International Organization for Migration said. Satellite imagery analyzed by Human Rights Watch indicated that many homes in northern Rakhine state were set ablaze. Most of Myanmar’s estimated 1 million Rohingya Muslims live in northern Rakhine. They face severe persecution in the Buddhist-majority country, which denies them citizenship and basic rights. Main Uddin, a government official in Ukhiya in Cox’s Bazar, said the survivors reported that about 86 Hindus had been killed by armed groups in three villages since last Friday. Survivors said Myanmar soldiers were everywhere and “armed people” were also burning houses and killing people. “They have been sheltered in an abandoned poultry farm there. Bangladeshi Hindus are helping them,” he said. Alam reported from Dhaka, Bangladesh. Previous articleFormer Colombian rebels change their name … to FARC?